buy Premarin mexico Your Domain Name Thomas Vernon McGarity was born in Right, Tennessee on December 1, 1921. He was drafted into the United States Army on November 24, 1942, one week before his twenty-first birthday. He was eventually assigned to Company L, 3rd Battalion, 393rd Infantry Regiment, part of the 99th Infantry Division. The 99th Infantry Division was spread out thinly along the front line when German artillery crashed down on them, signalling the beginning of Hitler’s last-gasp offensive in the west. McGarity, a Technical Sergeant and a squad leader, was wounded in the initial barrages. He received aid, but refused evacuation and returned to lead his men in a determined stand against a vastly numerically superior enemy. 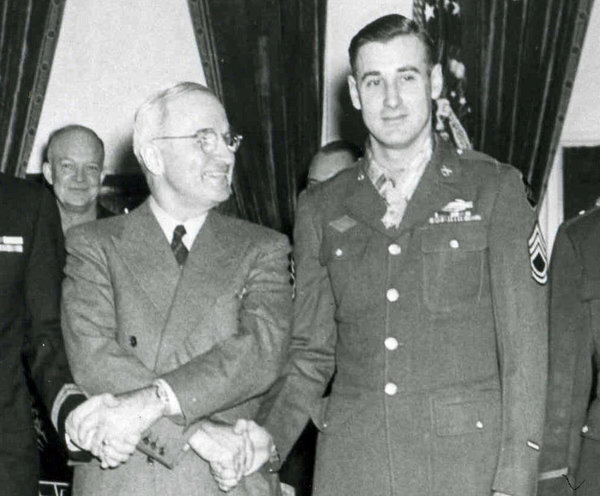 He was awarded the 99th Infantry Division’s sole Medal of Honor for what transpired. McGarity spent the remainder of the war as a German prisoner, and was liberated with the end of hostilities in May 1945. His Medal of Honor was presented to him at the White House by President Harry S. Truman. He worked for the Veterans Administration as a civilian and passed away at the age of 91 on May 21, 2013. He rests in peace in the Memorial Park Cemetery of Memphis, Tennessee.